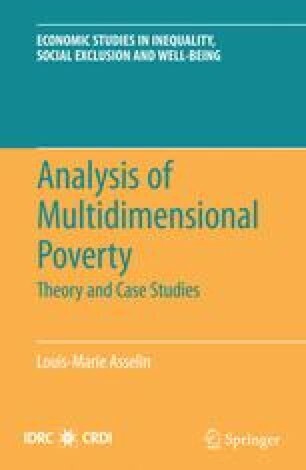 According to our two-step approach to multidimensional poverty indices, we come out of the first step with a composite indicator of poverty (CIP) that is positive and whose increase is interpreted as a better basic welfare. This CIP then has the technical characteristics of an “income” indicator, and any money-metric technique developed for poverty and inequality analysis can in principle be applied to this CIP. Such applications are not developed here and are left to case studies presented in Part II.